The University of Central Florida’s cyber defense team successfully defended its status as top dog over the weekend, winning the National Collegiate Cyber Defense Competition for the second year in a row. The Collegiate Cyber Defense Club @ UCF – also known as Hack@UCF – bested nine other teams to win the competition in San Antonio from Friday through Sunday. University of California, Berkeley, earned second place and the Rochester Institute of Technology took third. 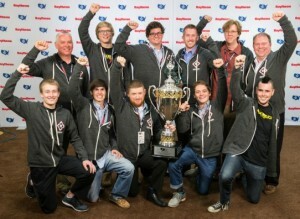 The victory earned team members big perks from competition partner Raytheon. The company offered each student an internship, and for those graduating, a job. Raytheon also will bring the team to Washington, D.C., over the summer to tour top research and national security cyber sites. Last year, the team’s win brought members to the White House for a congratulatory visit with Vice President Joe Biden. The competition organized by the Center for Infrastructure Assurance and Security is the largest of its kind. Ten regional contests around the country included roughly 200 teams consisting of more than 2,400 students. One winning team from each regional moved on to take a shot at the national title. The competition is sponsored by major companies and institutions with a vested interest in network security, including the Department of Homeland Security, National Security Agency, U.S. Army Intelligence and Security Command, U.S. Space and Naval Warfare Systems Command, Amazon, Walmart, McAfee, Goldman Sachs and more. In the scenario presented in San Antonio, teams acted as the information technology department for an electric utility. As they took phone calls from customers complaining about power outages, they also had to defend against cyber-attacks from a team of 20 professional white-hat hackers trying to penetrate their network. Austin Brogle and Alex Davis compete. Five of the eight members from last year’s winning UCF team returned this year. That experience, plus hours of preparation, paid off. Team members trained four hours at a stretch, three days a week, through the spring semester. The team included Carlos Beltran, Austin Brogle, Conner Brooks, Jason Cooper, Alex Davis, Tyler Dever, Kevin DiClemente and Jon Lundstrom. Alternate members who trained with the team include Kevin Colley, Nathaniel Dennis, Andreas Giron and Shane Welch. “The talented men and women who demonstrated their impressive skills at the 2015 National Collegiate Cyber Defense Competition give us great confidence in the ability of the next generation of cyber defenders to guard our critical cyber infrastructure,” said Dave Wajsgras, president of Raytheon Intelligence, Information and Services.